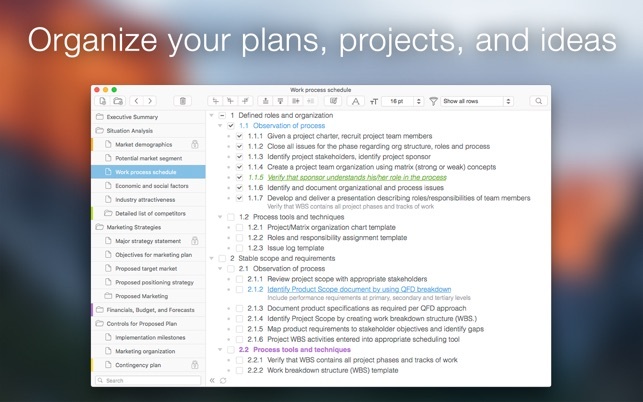 Outlines are interactive and highly customizable notes that organize your plans, projects, and ideas in a clear way. 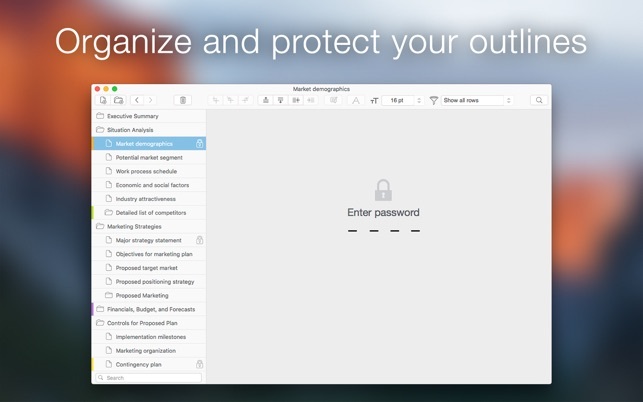 Cloud Outliner enables you to create and share outlines between your Mac, iOS devices, and Evernote account. * Got a sudden flash of insight? Don't risk forgetting it – just enter it right away on whatever device is closest, and see your changes synchronized with all your devices at once. 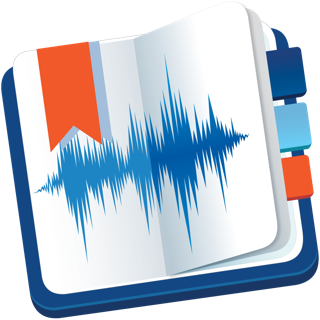 This tool is not yet another notebook app or sticky notes organizer for mobile devices. Not even a little! 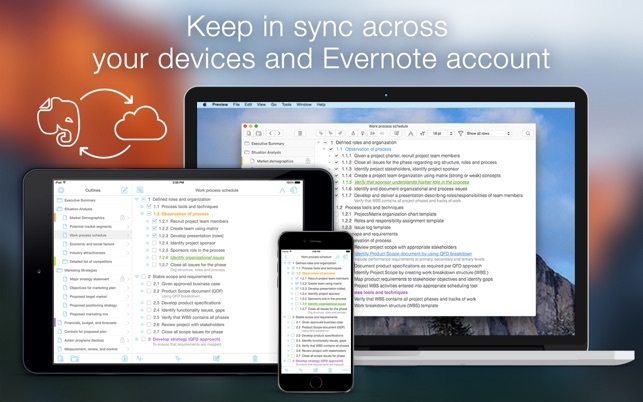 Thanks to tight integration with Evernote and iCloud, extensive import and export functionality, rich-text editor, and a truly intuitive user interface, the solution will become your reliable assistant both at work and at home. 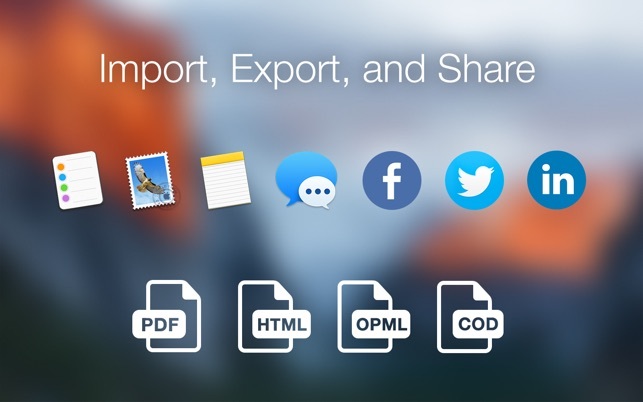 You can seamlessly synchronize your records with Evernote and iCloud, share your data in different ways (PDF, OPML, HTML, plain text, emails, and even paper copies), and format your notes in the built-in powerful editor. All your thoughts, ideas, ongoing tasks, and even arbitrary memos will be kept safe and available close at hand. You can simply focus on the things that really matter – and the Cloud Outliner will cover everything else. 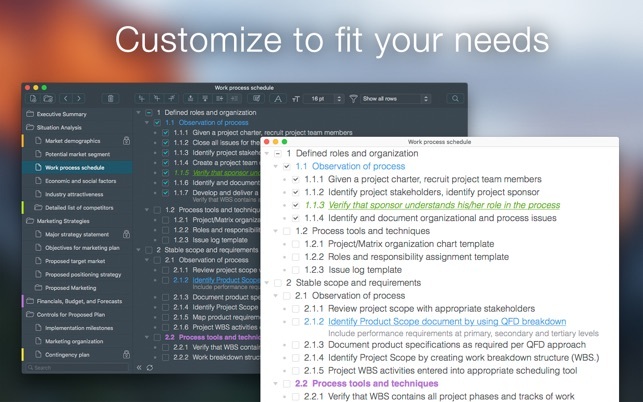 Install Cloud Outliner to reduce complexity and easily align your daily routines! * Sync with iOS-devices requires Cloud Outliner Pro for iOS, sold separately. I think this is a well designed, intuititive program. It allows you to dump and organize your thoughts, easily create hierarchy, search, and show/hide checked/unchecked. HOWEVER, I think it is not honest that not only can’t this program print, but they don’t disclose this. You go to print and the menu flashes but nothing happens. I was surprised when I needed to take something with me and realized that you can’t print at all. I needed to save as PDF and print the PDF. When I emailed support twice, and both times they responded within three days. The first answer was: "Print feature doesn't work as essential on some devices. We are trying to find out why. Please, sorry for the temporary inconveniences.” I emailed a month later asking for an update, thinking that they would be working on it and was told it still isn’t fixed “for now.” Now I see this has been an issue for months. It isn’t “for now,” it just doesn’t work and should be disclosed - at least so users won’t think they are crazy and wonder why nothing is printing. It would save time to just tell us - “this program is for those who do not need to print” or that there is a workaround. If you don’t need to print it is 4-5 stars. Only other quibble is that the formating fonts selections are different on the Format menu than on right-click and strike through is only available on the menu and outline is only available on right-click. UPDATE for 2.3 - slight usability tweaks and improved syncing. UPDATE for 2.1 - I raised my rating from 3 to 4 stars. The update has made the program more stable. The crashes from right clicks on outline points seesm to be fixed. I’ve been using Cloud Outliner 2 on my iPad since September, and while it works well, it is harder to copy and paste and move things on the iPad than on a Mac, so I’ve been anxiously waiting for Cloud Outliner 2 to come out on the Mac. I’ve installed it and all my outlines from my iPad instantly synced without a problem. I’ve found three glitches so far after 2 weeks. if you have the cursor on the right side over or in an outline point, the cursor will not scroll from the trackpad. You can scroll via the scroll bar on the far right, but not with a normal trackpad scroll. The most frustrating glitch is that it is often extremely difficult or impossible to select text within an item in an outline to edit it. The third glitch is much more serious and warrented me downgrading the app to 3 stars. It crashes often, mostly when right clicking on an outline point. It crashes as soon as you do the right click. I’m on a 2014 version retina iMac. This app is VERY good at categorizing my thoughts. BUT... BUT... We need a global serach function. That should be simple to implement. Now that I have lots of categories and many hundreds of thoughts simply I CA NOT locate a particular thought (outline element). AND YES, I use this app every day, but that's why I am choosing to make these comments. The author asks us to RATE his app. So that's the ONLY criticism that I have for this EXCELENT app. Nice work! Simplicity and speed is why I use this app. I also use the iPhone / iPad app side-by-side with the desktop app. Everything is perfectly synched between them. This is the most flexible and direct approach that I have found. I find it to be much better than the more robust (complicated) apps. This is the best / easiest to use outline program in the App Store. It’s better because the application is not bloated with gee whiz stuff. I use this to organize my tasks.